As outlined in my first bread post, I enjoy baking bread, particularly sourdough bread. What we call sourdough today is naturally-leavened bread using an age-old baking technique. Before commercial yeast, or even an understanding of yeast in general, bakers would make bread by reserving a portion of the previous day's dough and mixing it into the new dough. This "starter" would leaven the new dough and the baker would repeat this process daily. The starter is a complex culture of wild yeasts and bacteria that flourish in that particular bakery and would vary across different climates. Thus, no sourdough bread will be exactly the same. I created my starter directly from the micro-flora that exist in my kitchen, using the steps found here. Like in the first post, I was again inspired by Sean Paxton, the Homebrew Chef, as featured on his Brewing Network show. In the episode that aired in mid January, Sean explained how you can use brewing ingredients as cooking ingredients. In particular, he discussed the complexities of malted barley and how it can be worked into existing dishes, including baked desserts and breads. The idea was that you take malted barley and turn it into flour in a clean coffee grinder and then use it like you would any other flour. 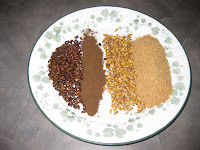 The main concerns about the malt flour was that it does not have a strong gluten content and that its ability to add sweetness or roasted bitterness needed to be factored into the recipe. Other than that, it can easily add additional flavor complexity and is easy to use. I thought this was a brilliant idea and started experimenting with it immediately. My kids and I tasted the different specialty malts I have in the brewing closet and we selected Weyermann's carared malt and Thomas Fawcett's pale chocolate malt. I took a sourdough recipe I have made dozens of times in the past, Norwich Sourdough Bread from the Wild Yeast blog, and substituted 15 grams of pale chocolate and 45 grams of carared malt for 60 grams of bread flour. The rest of the ingredients and steps in the recipe remained unchanged. 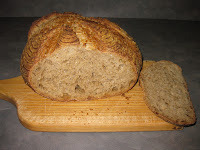 The resulting bread was much darker than normal, both in the crust and the crumb. The bread aroma was about the same, which smelled wonderfully rich with a hint of sourness. The flavor had a distinctive roast quality in it which could only have come from the pale chocolate malt. That roast character obscured anything that I could have tasted from the carared and even the fresh spicy flavor that usually comes from rye flour. In hindsight, it may have been better to try baking with individual malts first to determine their flavor before combining them. But, it was good bread all the same. I will definitely be experimenting further. Has anyone else tried baking with malt flour? Leave us a comment and let us know. To Good Bread and Good Beer! I've done it with spent grains from my porter mashes and it was delicious. Thanks for leaving a comment. I have also worked with spent grains before. The resulting bread is usually fairly dense in the crumb, but very good. I used the spent grains in a relatively low proportion with the other bread flours. I have heard of people freezing their spent grains to save for use another day.